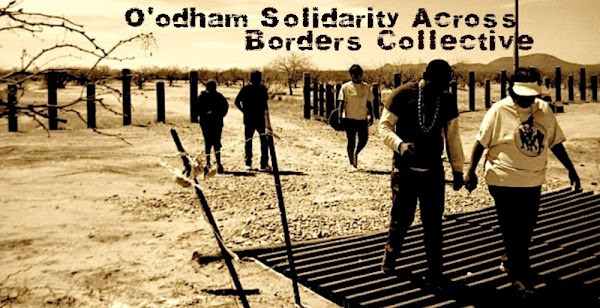 Tucson, AZ – More than a dozen people occupied Border Patrol headquarters at Davis-Monthan Airforce Base today in an act of peaceful resistance. The group includes members of Indigenous Nations of Arizona, migrants, people of color and white allies. Six people used chains and other devices to lock themselves in the building. These Arizona residents disrupted the Border Patrol operations to demand that Border Patrol (BP), Immigration Customs Enforcement (ICE), their parent entity, the Department of Homeland Security (DHS), and the Obama administration end militarization of the border, end the criminalization of immigrant communities, and end their campaign of terror which tear families apart through increasing numbers of raids and deportations. 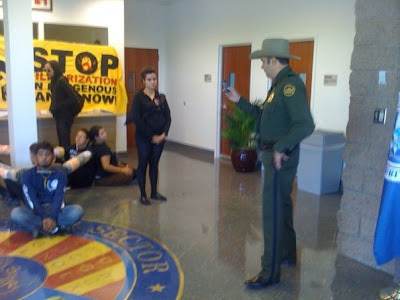 The protesters also call on the State of Arizona to repeal the racist Senate Bill 1070 that criminalizes immigrant communities on the state level, makes it illegal to transport or harbor an undocumented person regardless of family relationship, requires police agencies to engage in racial profiling, and ultimately is an attempt to ethnically cleanse Arizona of those with brown skin. This act of civil disobedience was only the latest in an increasing wave of direct action targeting the federal government’s terrorist immigration policies. Thank you for this incredibly powerful historical, political and cultural analysis, and the amazing direct action. I am in solidarity with you 100%!